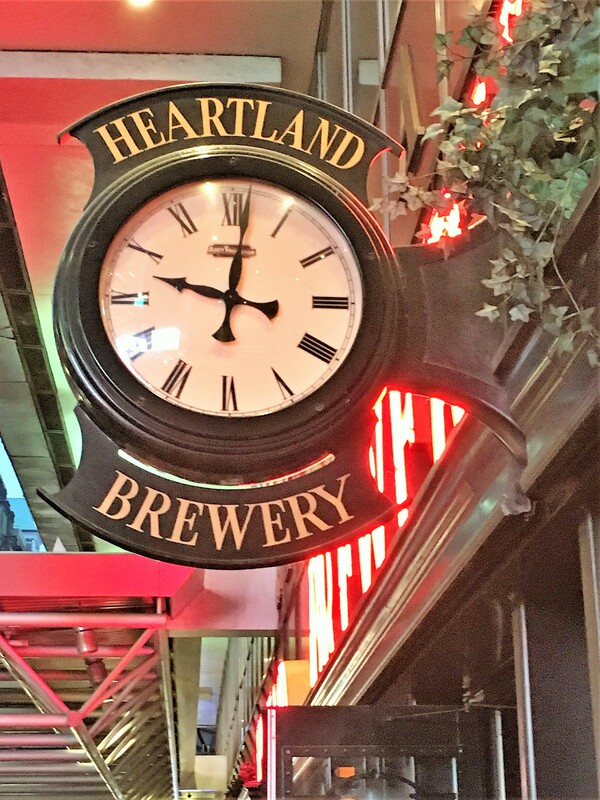 Autumn (and Beerchasing) in New York…. 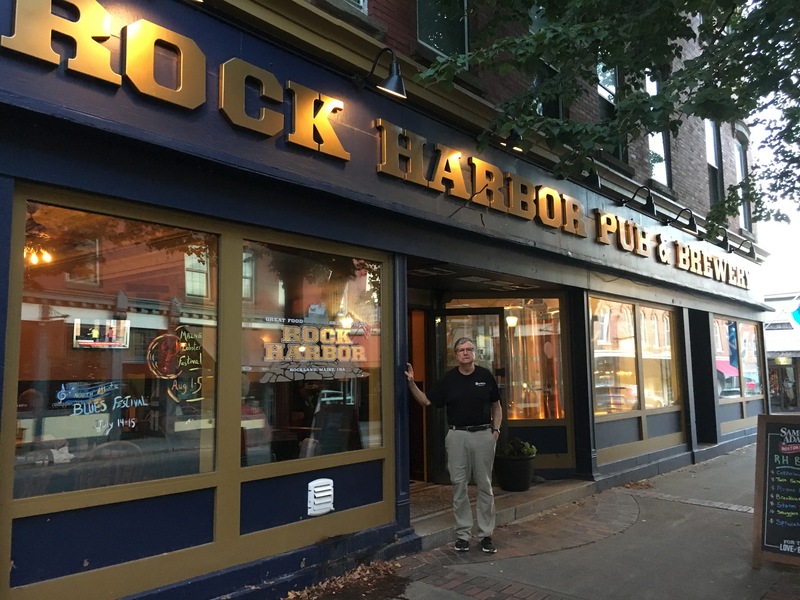 Since the commencement of Thebeerchaser’s Tour of Bars, Taverns and Pubs in 2011, I have visited and reviewed upwards of 250 establishments – initially just in the Portland area. 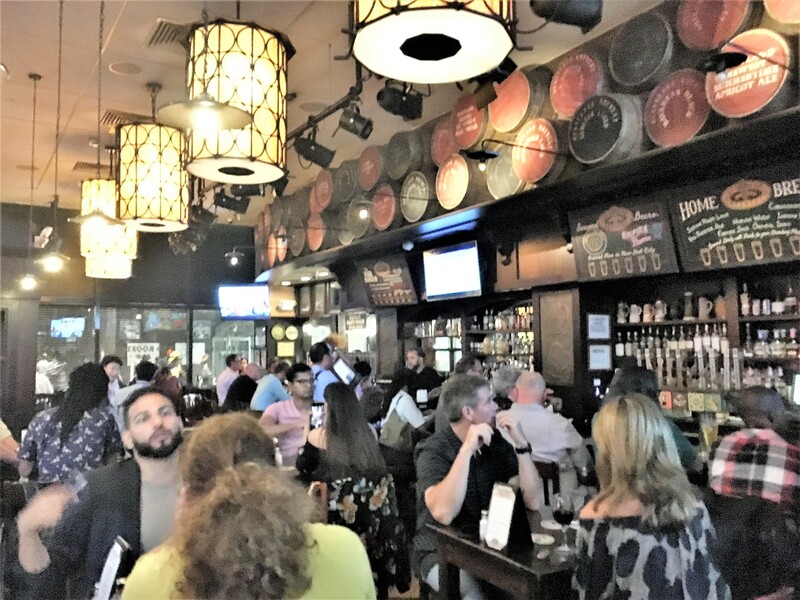 Our retirement travel, however, prompted expanding the “journey” to bars in other locations ranging from those in Europe, Alaska, Hawaii and many regions of the US to those throughout the State of Oregon including the coast and Eastern Oregon. 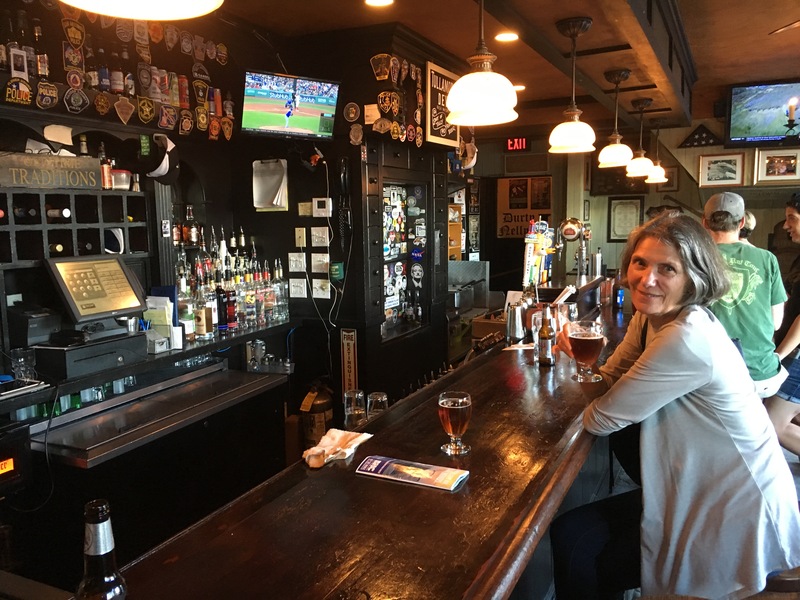 My wife, Janet, although not accompanying me to dive bars, has enjoyed finding new breweries and neighborhood pubs on these trips. She has developed a fondness for IPA’s – a different route than her previous preference for only wine. 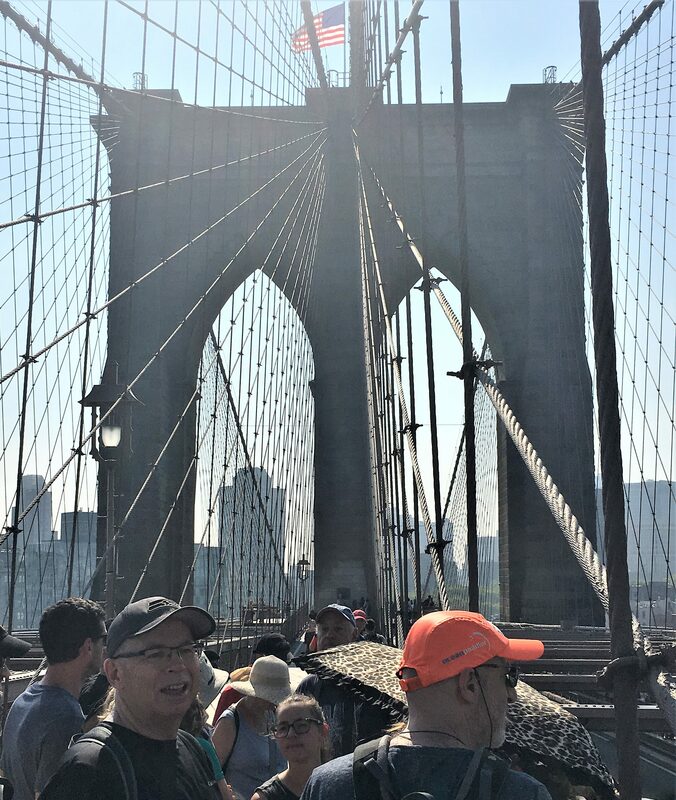 On our most recent trip to New York City, Maine and Boston, we saw breathtaking scenery, explored another one of our wonderful National Parks (Acadia), toured interesting museums, went to a Broadway play, attended the Stephen Colbert Show, took some great hikes/bicycle rides and had some great food in both urban and rural eateries. 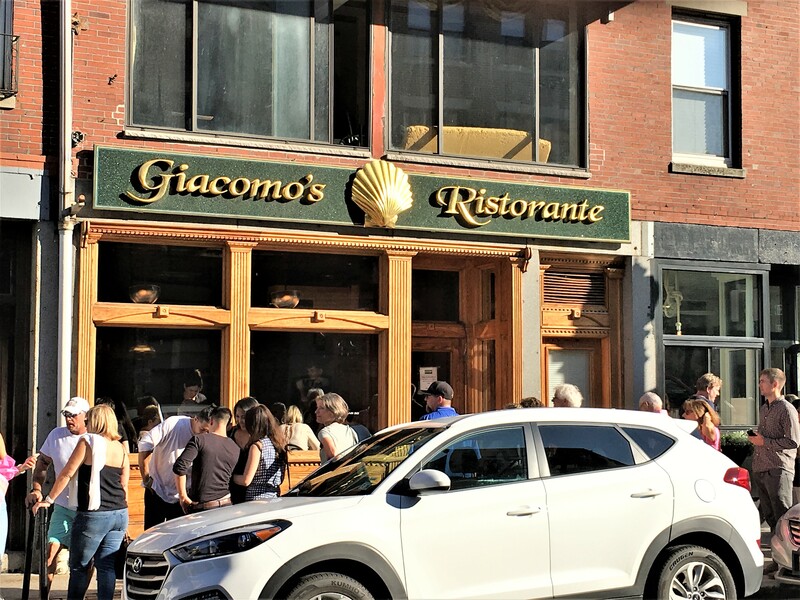 During this time, we also raised a mug in five establishments in New York City, fifteen in Maine and one in Boston. 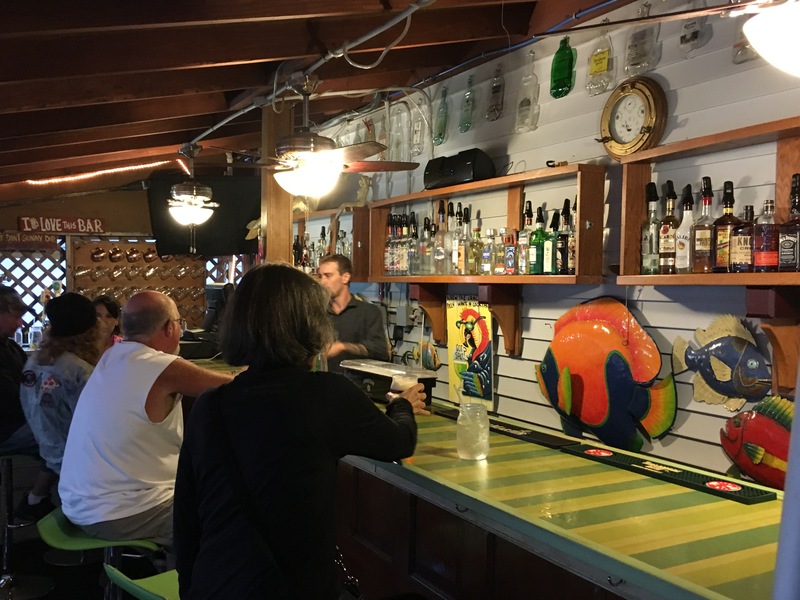 Another tip for travelers who want to have a similar experience – always sit at the bar if stools are open. 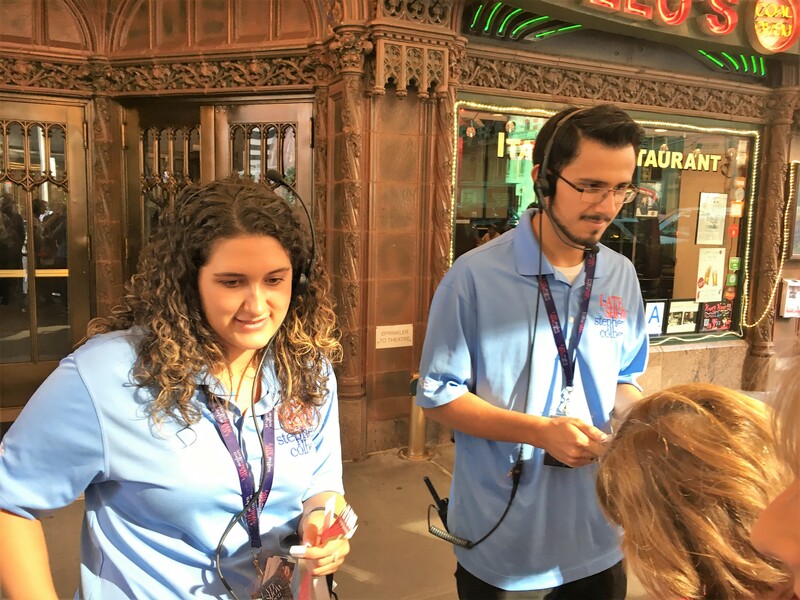 This provides the best chance to talk to a bartender and meet locals or strangers and share their experiences. 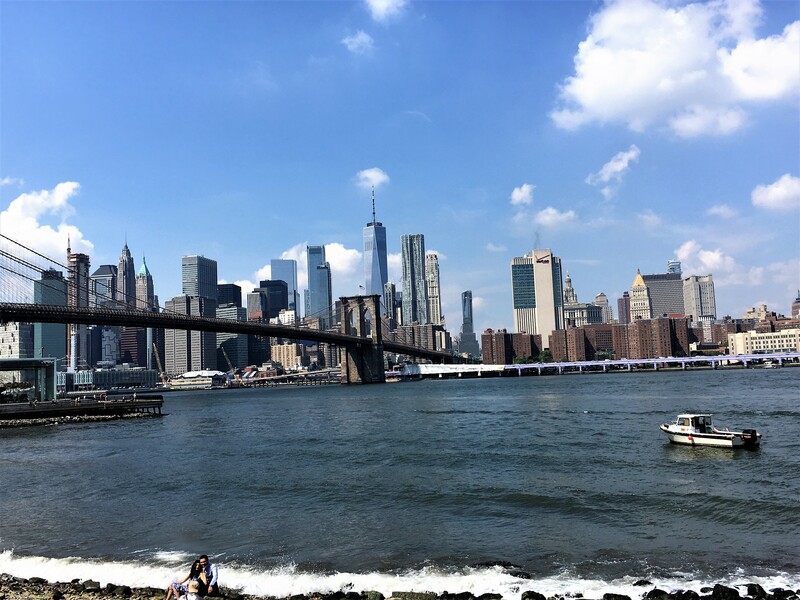 This post will relate most of our three and one-half day stay in New York City, with two follow-up posts covering the final day in NYC, Maine and Boston. 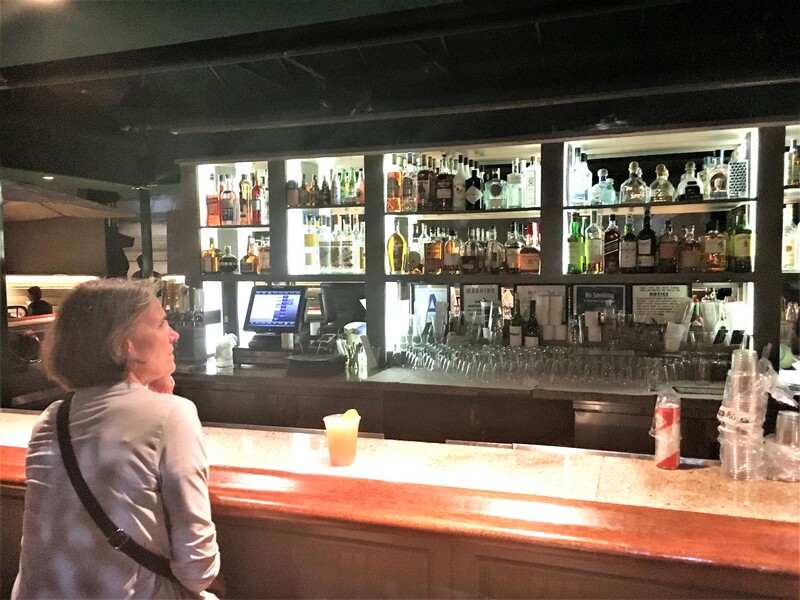 Although this blog is about bars and beer, given the sights seen and the cultural experiences, I ask your indulgence to expand the narrative to be a Travelogue, of sorts, including pictures which made this a vacation we will long remember. It should be noted for those who remember one of the late John Candy’s best films, this was a trip that involved planes, trains, subway, automobiles, buses, trolley, bicycles and even kayaks. 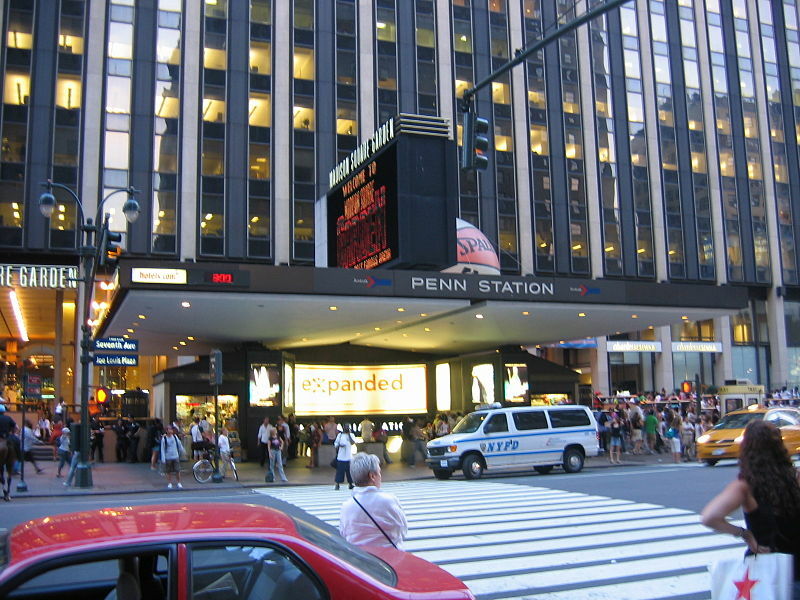 We flew into the Newark Airport and took the train into Penn Station, which was only about one-half mile from our hotel downtown on West 37th Street between 5th Ave. and the Avenue of the Amercas. A great location in the heart of the City. We split a beer on the patio bar outside the Marriott Pulse Hotel with two other couples. One of them was an electronic engineer – he and his wife were from Australia. He had an impressive academic background and he pointed to the “Columbia” on my sport shirt and told me that he thought it was an impressive Ivy League University. 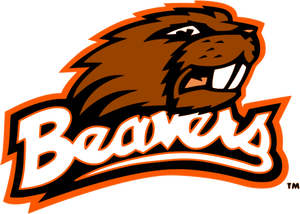 While Oregon State needs no apology, I simply informed him that Columbia was an Oregon sportswear company. 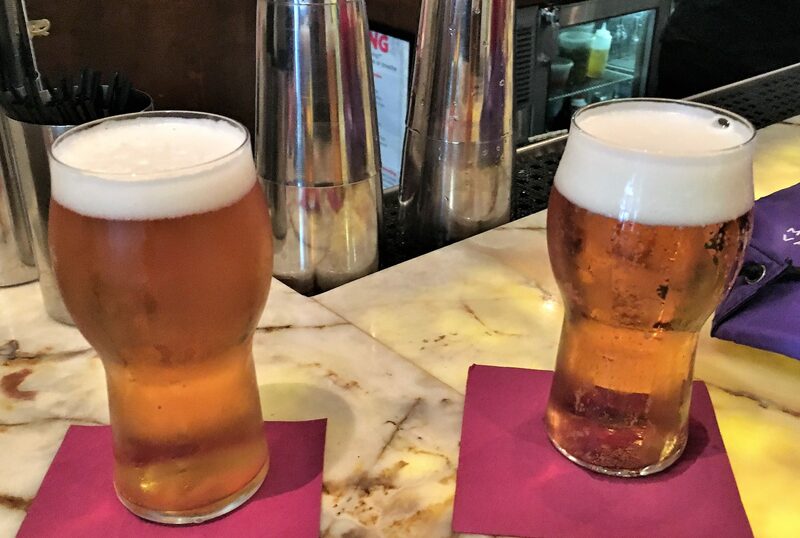 We both had a new beer Brooklyn Brewing’s Defender IPA brewed with Cascade Hops. (I wish I had known at the time that these Oregon hops which are the most widely used hops by craft breweries in the US and were “developed in the USDA breeding program at Oregon State University in the 1960’s.” Wikipedia). Not the Ivy League, but a great aggie school! 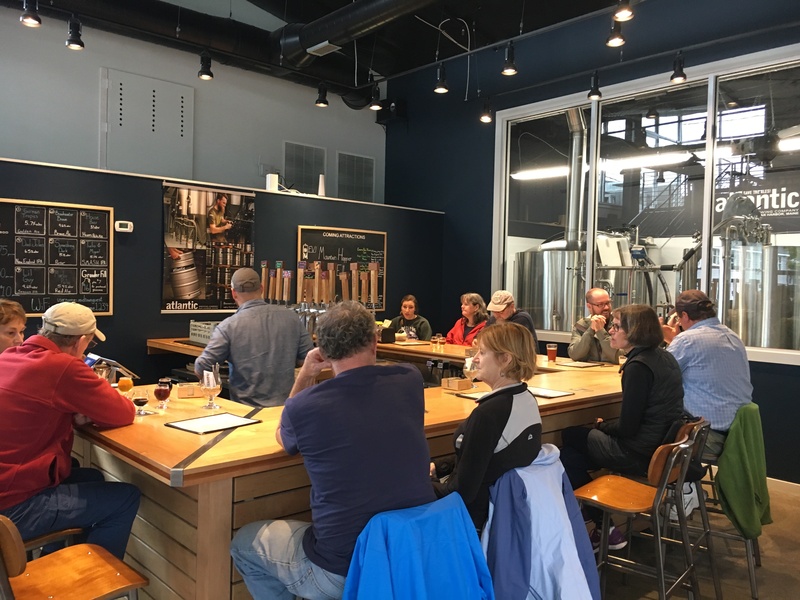 The brevity of our stay precluded visiting the brewery itself, but it has an interesting history starting with its roots in 1988. It’s founder, Steve Hindy, is a former AP correspondent who covered the Middle East during a war-torn period. When his Beirut hotel was hit by a mortar shell, he decided he and his family should return to New York. Since we got to the hotel in the late afternoon, we had an early dinner after walking through Midtown. The ubiquitous sirens and horns create an underlying clamer which residents ignore. 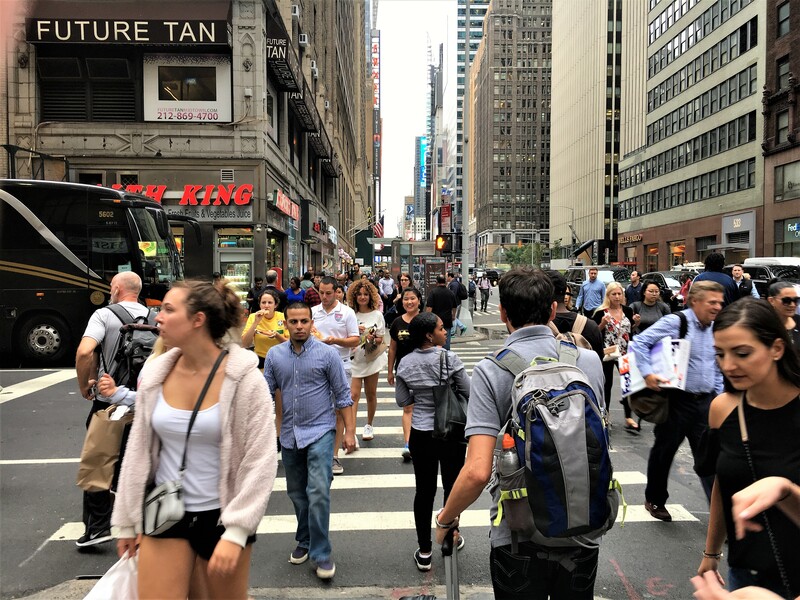 I was struck by the sense of purpose reflected by pedestrians – also the incredible diversity. 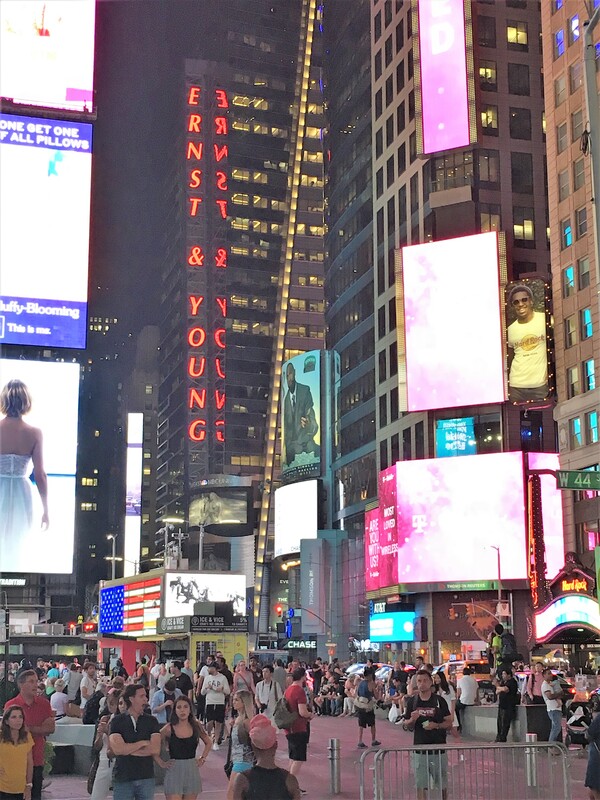 Take a look at this 7th Ave. intersection near Penn Station. 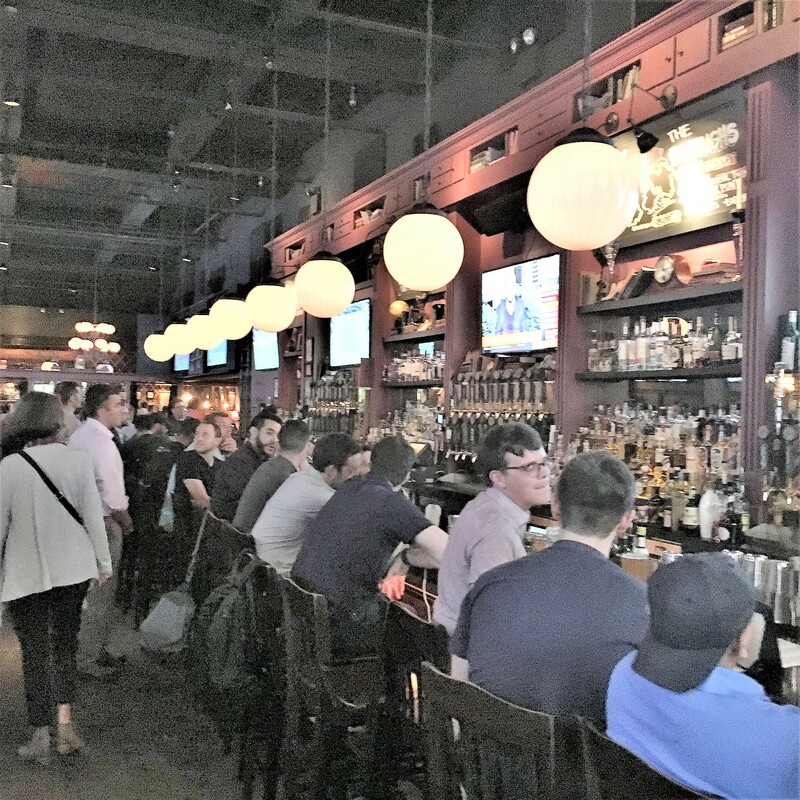 It aptly demonstrates the mix of nationalities and demographics that make New York City such an interesting and cultural melting pot — a good thing and one that is reflected in the amazing assortment of restaurants, shops and neighborhoods. 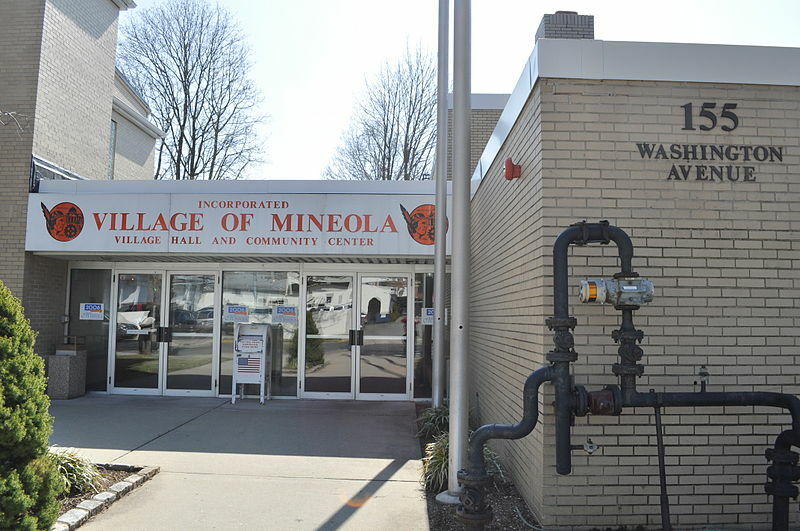 Although some might question the substance of my claim, I felt it was a homecoming, of sorts, since I was born in Mineola, New York when we lived in Merrick, Long Island. 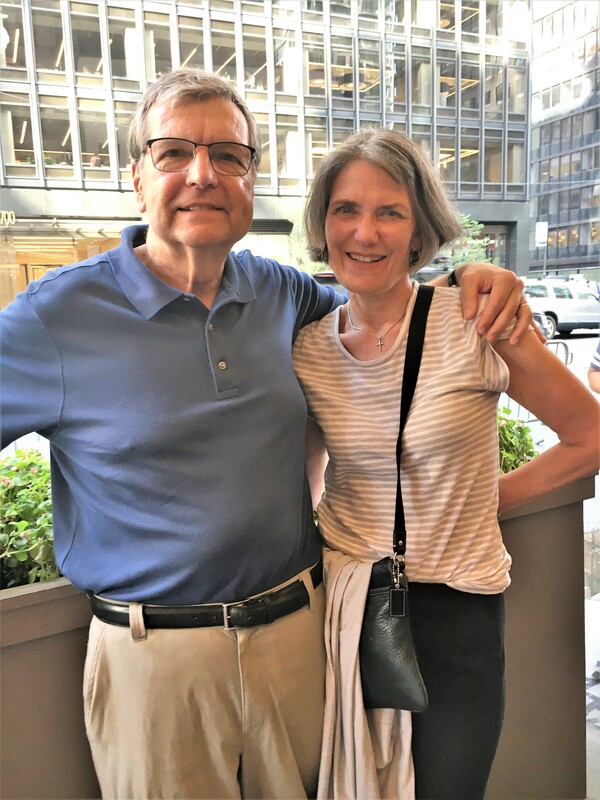 We moved to Philadelphia when I was eighteen-months old and other than my brother, Garry’s graduation from West Point, I had only visited the City once before this trip. I agreed that the doctors and nurses who would have attended me would now be in either their late nineties or past the century mark. This hospital also rates only three out of five stars on Yelp (if that’s where you look to choose a medical facility….) One reviewer called it a “third-world facility” while another said her father “walked out and said he would rather die than continue the ER visit.” (I’m sure it was better than in the late ’40’s). 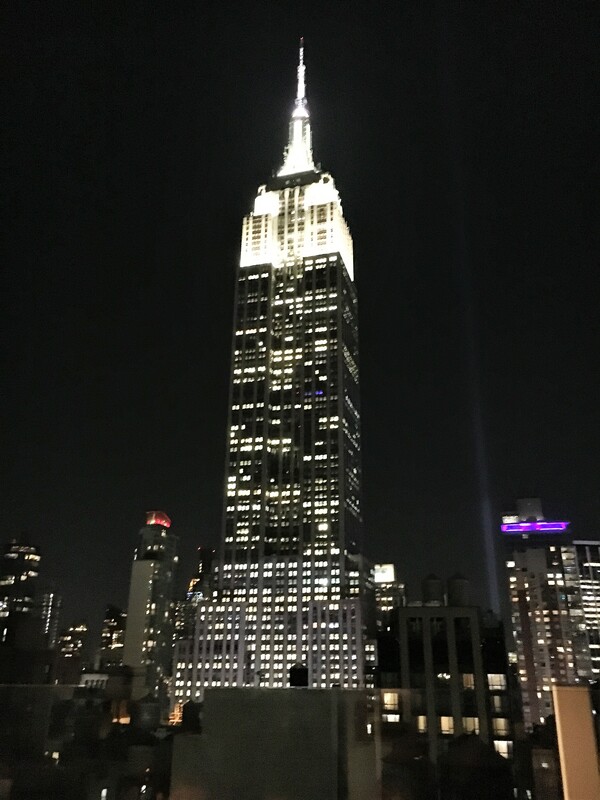 The view of the Empire State Building from our hotel’s rooftop bar. Our restaurant that night was Butter – we had an excellent meal and we ate in the dining room although it also had a beautiful bar that was filled. That night we capped off our evening with a drink on the open-air rooftop bar of the hotel. It was notable for its impressive and unforgettable view of the Empire State Building. The American Pilsner that we split was also very good and from another Brooklyn brewery – War Flag Brewing. 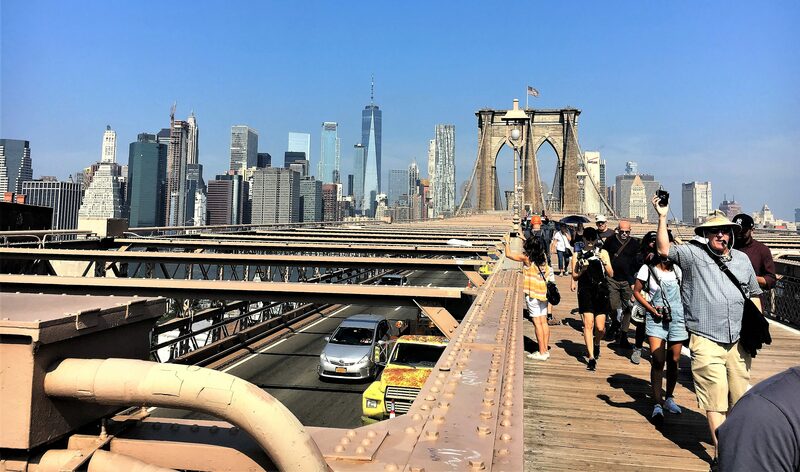 The next morning was a 3 ½ hour walking tour across the Brooklyn Bridge and through Brooklyn by Free Tours by Foot, an organization that has proven great for us in both Charleston, South Carolina and Savannah, Georgia. 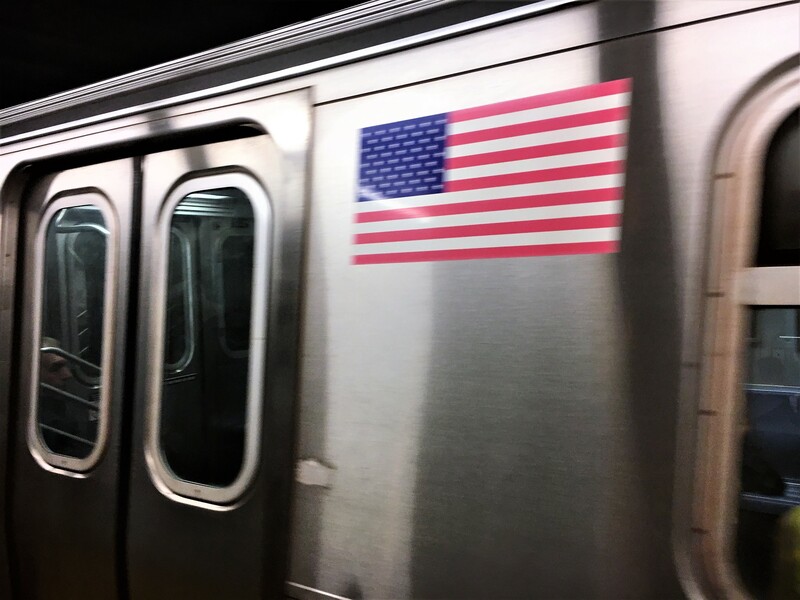 We were impressed by the subway system and used it each day we were in the City. 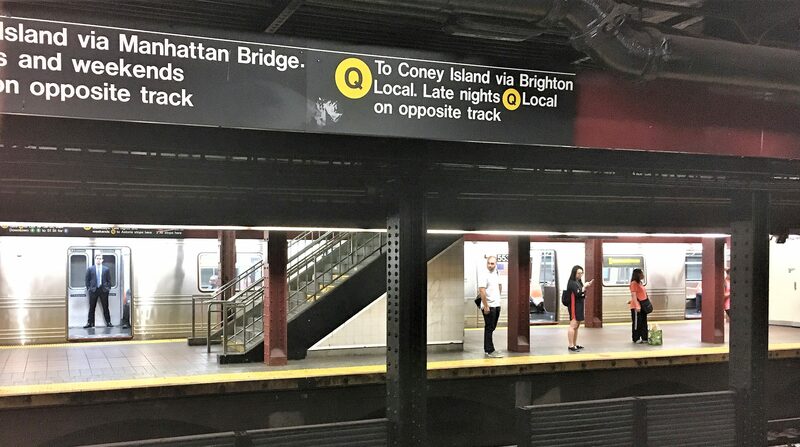 People were very helpful and besides hopping on a train after the Walking Tour that took us farther into Brooklyn rather than Uptown to Manhattan – it was great. The problem was easily resolved by getting out at the first station and did not require an additional fare. 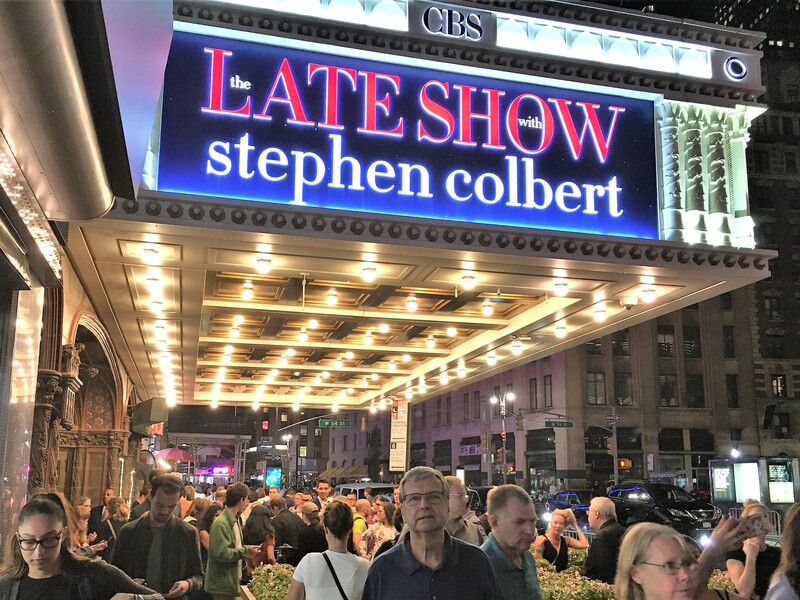 That evening was one of the highlights of the visit – VIP tickets to the Stephen Colbert show on Thursday thanks to my oboe instructor, Kelly Gronli, whose brother-in-law, Gabe, is a writer on the show. Unlike most of the audience who had to wait from late morning until the 4:30 admission time at the Ed Sullivan Theater, we got in line at 4:00 and had great seats in the first row of the balcony. Given the 104 degree heat outside, I “froze” in the air-conditioned studio while we waited for Stephen to appear and during the taping – two nights on that Thursday which allowed us to see two monologues. It was a memorable experience. There are no pictures from the inside of the theater because their policy on cell phones and photos was similar to that at the Vatican in the Sistine Chapel. If they even viewed a cell phone or i-Pad, you would be extricated from the Theater, prevented from attending the show forever and presumably reported to the appropriate federal and state authorities or ex-communicated! 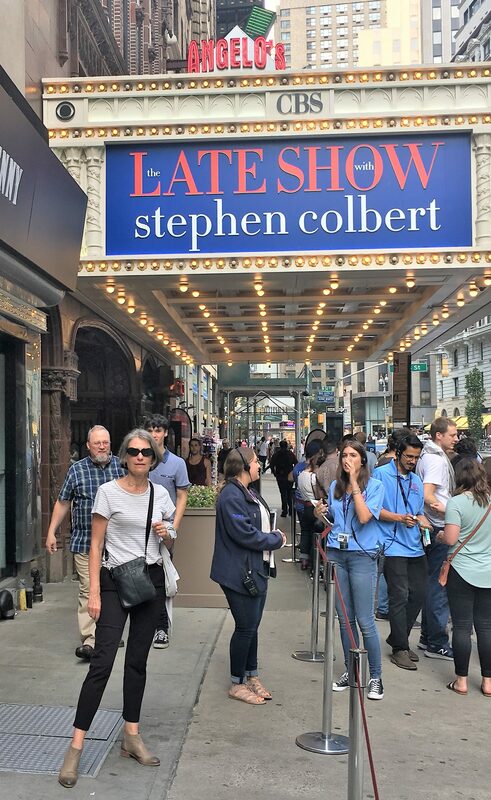 The Colbert band was amazing, Stephen was funny and candid when he spontaneously answered questsions from the audience before the show, his interviews of his guests – Emma Thompson and Troye Sivan (South African singer and actor) were superb. Since we got out of the theater so late, rather than a restaurant, we went to the attractive open air bar at Bryant Park where we had an expensive and disappointing quesadilla. We split a pint of Blue Moon Belgian White Ale because we were craving an orange…. 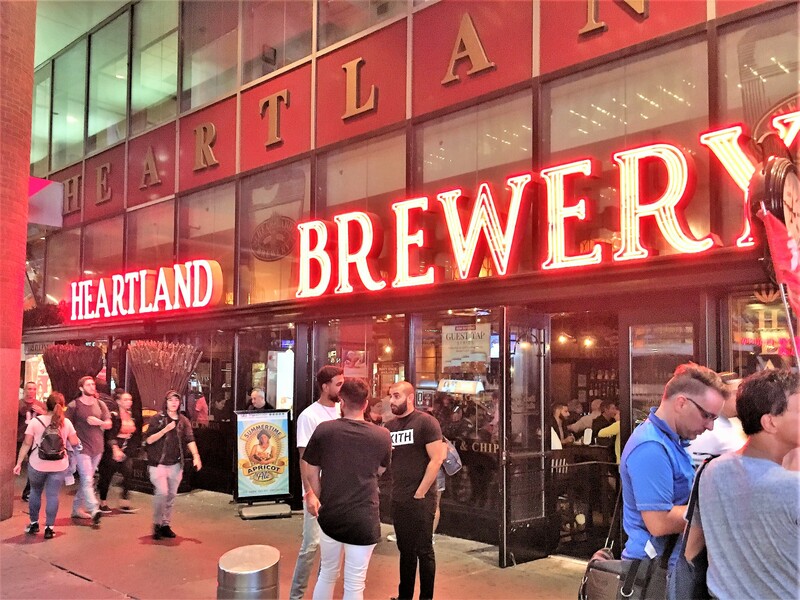 It had been a long day, we walked back and stopped, but did not have a beer in to the Times Square brewpub of employee-owned Heartland Brewery – one of three downtown locations of this craft brewery that opened in 1995. It looked interesting and was packed. The next post will cover our final day in New York City and the first part of our trip to Maine.